We are teak root furniture manufacturer and export company located in Java Indonesia, where the largest teak plantation in the world located. We have export permit and legal wood certificate. Mostly, our customers have retail store in Asia, Europe, Canada and USA bought 40' HC container of our products. They would be sold out in two weeks. I suggest you take the 40' HC. IFEX 2019 will be held on 11 – 14 March 2019 at Jakarta International Expo (JIEXPO). This is biggest business-to-business (B2B) furniture and craft exhibition in Indonesia and in the region. CV Alas Gembol also part of IFEX 2019 participant. Due to the nature of the teak root, the shape and appearance of each one will vary greatly so the pictures are examples but the one you receive will be completely unique, with no two pieces looking the same. See more awesome products ! Interesting to order a minimum 20 feet container ? Beautifully hand-crafted solid teak root coffee table from Java, Indonesia, where the largest teak plantation in the world located. Most noteworthy, the unique nature of the teak root means no two tables will ever look the same. 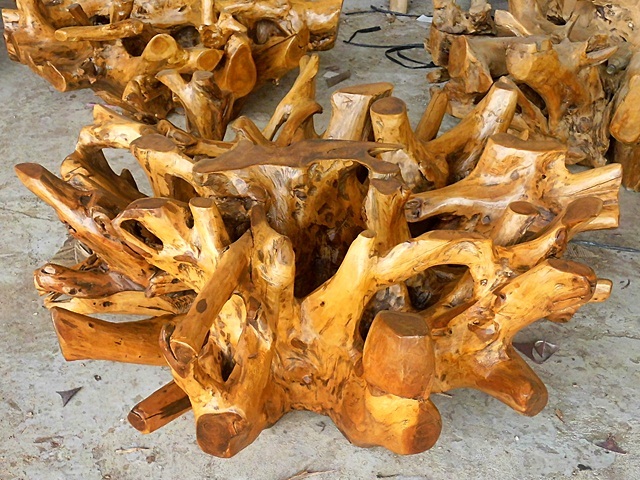 Suitable for indoor and outdoor, these stunning teak root coffee tables really are one of a kind. By the way, handmade from solid teak, the Java Teak range of furniture and accessories originate from Central Java and East Java. All the pieces in this range are fairly traded. Therefore, the teak wood is hand carved and sanded to a smooth waxed finish and teak oiled. 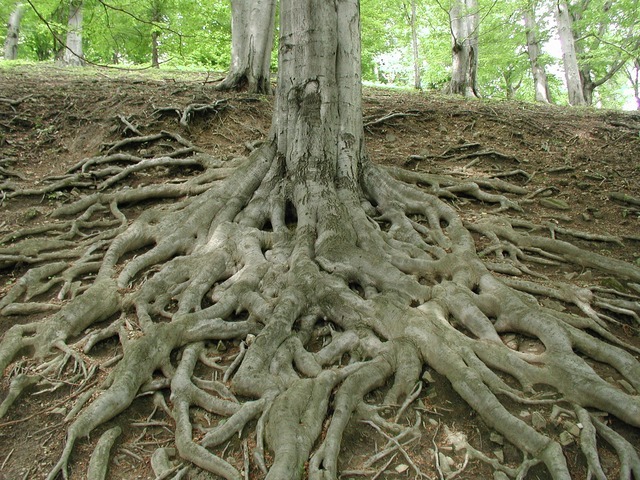 The teak root furniture is made from the root of teak trees, a by-product that would normally go to waste. Each piece is lovingly hand-crafted to create these unique, wonderful items. Due to the nature of the teak root, the shape and appearance of each one will vary greatly so the pictures are examples but the one you receive will be completely unique, with no two pieces looking the same. We have a lot of item and design of teak root table. Teak Wood, suar wood and lychee wood (longan wood) is a natural material that can be easily cut and shaped which gives you the chance to make all types of tables. For instance, you can make some shape of wood logs, or maybe create some interesting shape out of wood slices. Actually, there are a lot of model of huge item (length or diameter >1,2 meter). We have two kind of material for teak root table large size : suar wood and lychee wood (longan). You can buy just top of table, include with wooden leg or iron/stainless leg. We receive custom design of those leg. 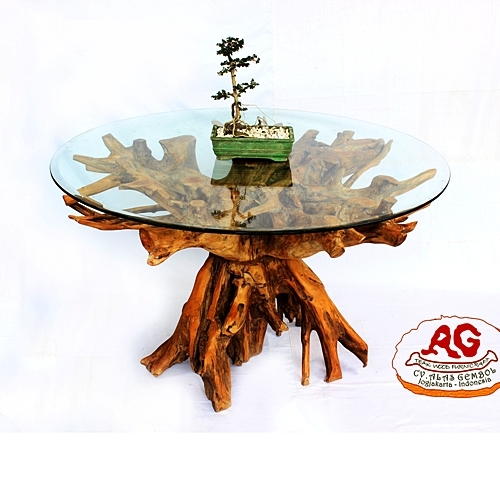 You can order our teak root table include the round/rectangular glass or just the table base (teak root only not include the glass top). Customer : Do you have an online catalog with sizes and prices? A : First of all, our website is an online catalog, But there is new products updated every month. Therefore we would like to send you our full catalog by email. Customer : What is the minimum purchase requirement? Customer : Do you provide samples? A : No. Because we send a lot of the product in one container. Free on board term. We pay the local handling, like trucking, send the document, etc. And the buyer pay the shipping from Port Semarang to buyer’s port. Usually our customer buy the samples in 20 ” container. Customer : Do you take pictures of the finished product? Customer : What is the finishing process for the wood products? A : As the buyer”s request. natural look with wax, shellac, white wash paint, water based paint, grey etc. Customer : Can we visit your factory and handpick our own pieces? A : Yes off course. That is a good plan to visit our factory and then talk about the products. Customer : What is your supply capability? Customer : Can you give us an example of how much product would fit in a 20’ container? How many tables , slabs, seats etc., just so we have an idea. A : Yes we would like to send our catalog, company profile and an example of order in 20′ container. Customer : How much do you estimate a 20’ container would cost? Customer : Do you have an estimate on how much the freight cost would be for a 20’ and 40’ container to our country? A : Yes we have.. please give us your port name. Usually our customer whose retail store in Asia, Europe, Canada and USA bought 40′ HC container of our products. They would be sold out in two weeks. I suggest you take the 40′ HC.